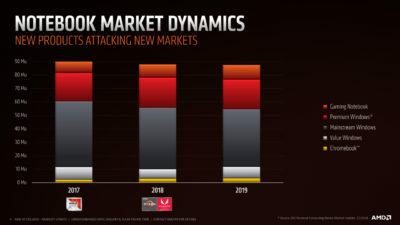 Throughout 2018, AMD’s Achilles heel was their performance in the notebook market as well as how they approached it. 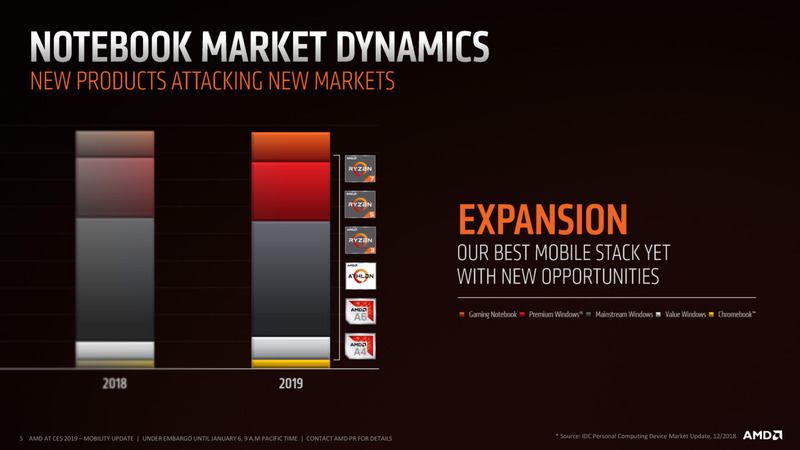 AMD achieved several design wins for their Raven Ridge mobile processors, finally bringing the company back into the playing field in the mid-range and high-end notebook markets. They maintainted a presence in the past with their APUs, but many of the devices were unappealing and lacked longevity. 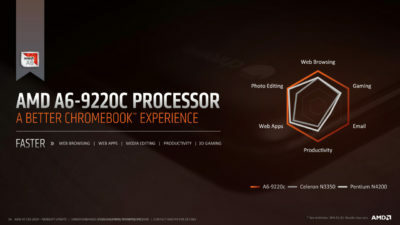 AMD hit back with force in late 2017 and throughout 2018 new designs came out from their partners that ranged from desirable to adequate. AMD plans to change all this, and more, in 2019, but it needed to take time before their bigger CES announcements to clear the air on their mobile strategy. This is it. 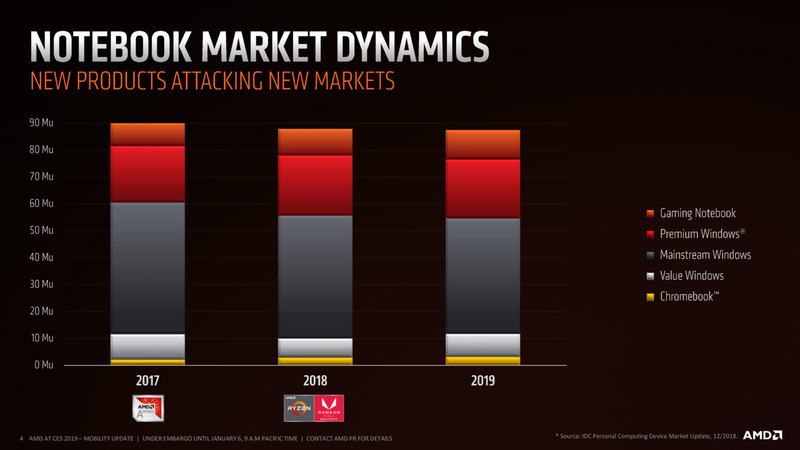 Moving into 2019, AMD sees the notebook market as a growth market, full of opportunity for products in the premium and mainstream markets. The pattern from 2017 onwards has been that the mainstream market is shrinking for all vendors, as more consumers are moving to higher-end products. This cycle is more because consumers desire things that the mainstream market no longer offers due to penny pinching, which forces them to look at higher-priced options. 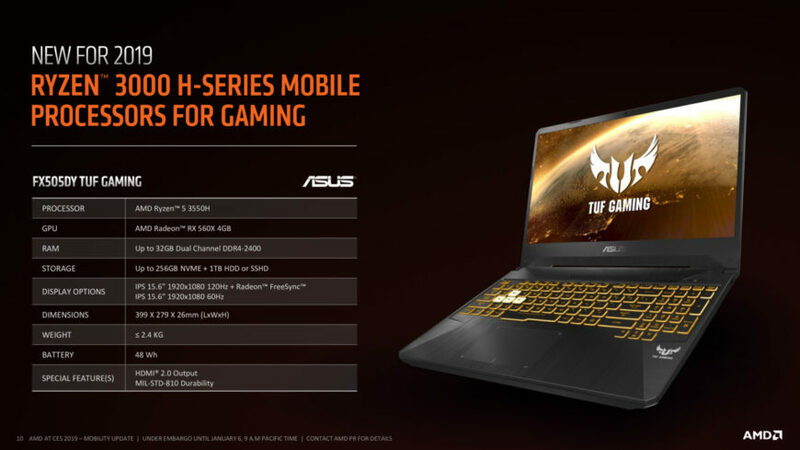 AMD sees opportunity here in offering notebooks with their APUs that deliver higher graphics performance in a cheaper budget. 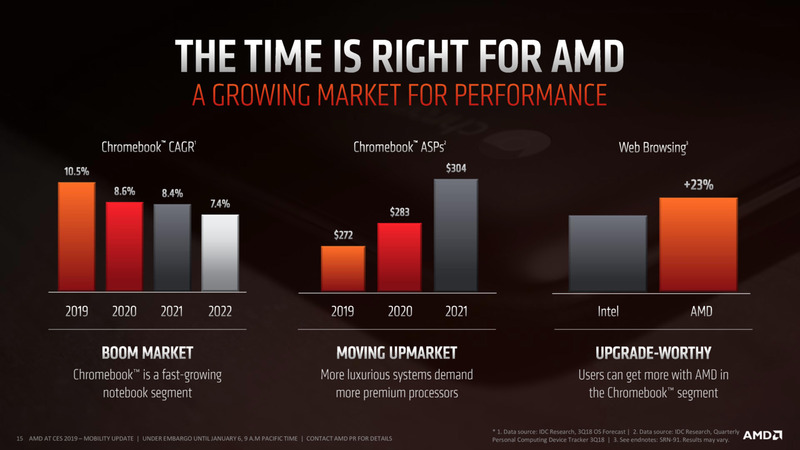 AMD also sees growth opportunities in budget devices at the Intel Pentium and Google Chromebook level. Y0u’ll notice the return of their A-series branding on the second slide. It is a surprising twist to the tale. 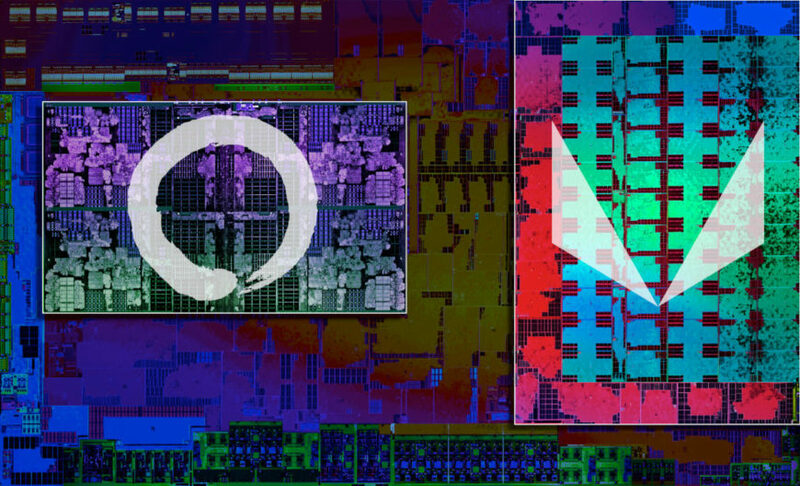 For the first time, AMD is laying all their cards on the table for the entire year, at least on the Raven Ridge side of things. As expected, the model number is now incremented to the 3000 series insteaf of the 2000 series, but there are new additions. The familiar U-series processors are still here – the Ryzen 3 3300U, the 3500U, and the 3700U are all successors to their Ryzen 2000 series counterparts. 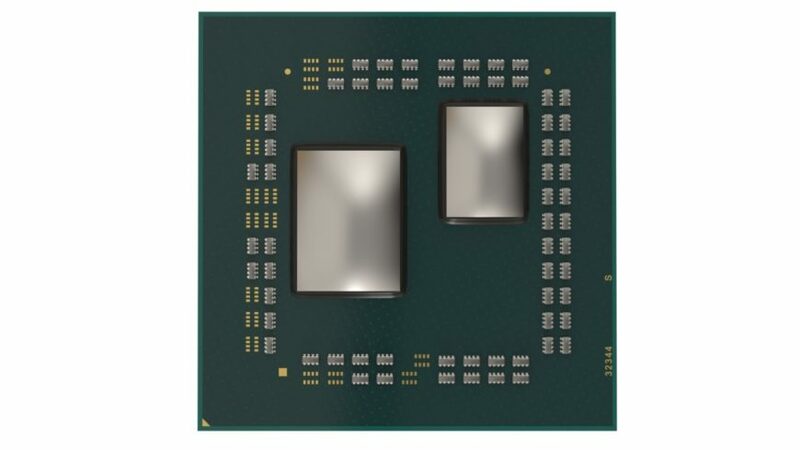 AMD is fabricating these new processors on a tweaked 12nm production process from Global Foundries, allowing them to pick which direction they want to take things: make their chips more efficient, or give them more speed without increasing power draw. For the U-series, it’s the efficiency option. 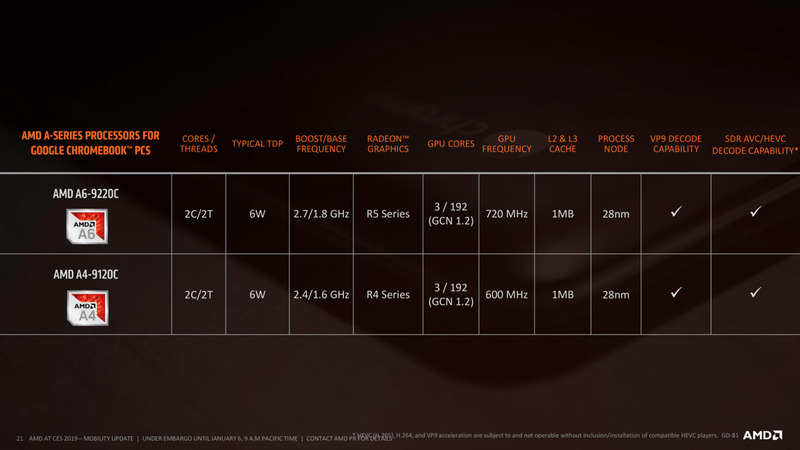 All AMD’s U-series processors are rated for 15W of thermal output. This is AMD’s first major change because the U-series had a sliding scale for vendors to pick what mode they wanted to run the chips in – 15W, 25W, or 35W – provided they had the right cooling setup. In the majority of cases, vendors did not implement this properly. Some developed thermal solutions for a 15W processor but set their clock speed bins too aggressively, hurting performance, or enabled a 25W power mode but didn’t have adequate cooling. This time around, it’s 15W or nothing. Moving forward, this should mean that all AMD U-series APUs will perform roughly the same when comparing models from different brands, but this still gives the vendors room to not cool the chip properly. Check out that 4.0GHz two-core boost in the Ryzen 7 3700U. The newcomers in the U-series are the Ryzen 3 3200U and 300U. These are budget options for consumers and notebook vendors who want to save on cost, and should be found in cheap 15-inch designs or in 14-inch and smaller netbooks to give Intel’s Celeron and Pentium lineups a run for their money. These two chips only ship with 192 shader cores, but should be adequate for light gaming at 720p. And then finally, there’s the H-series. 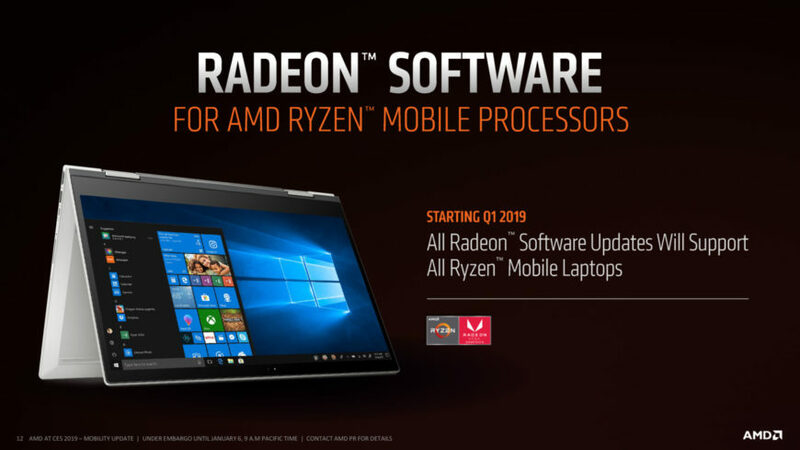 Like Intel’s H-series chips, AMD’s H-series family is designed for use in powerful notebook form factors like high-end gaming notebooks or in portable workstations where performance is needed. The Ryzen 5 3550H and Ryzen 7 3750H are 35W processors with up to 4.0GHz boost speeds on two cores and four threads, and are designed to extract the most performance in a chassis with adequate cooling. Keen-eyed readers will notice that the Ryzen 7 3700U and 3750H are identical in specs aside from the power draw. It will be interesting to see how closely they match up. 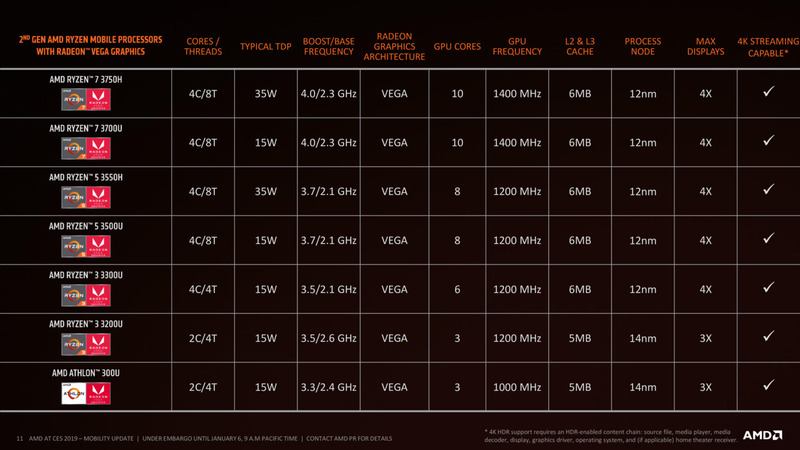 AMD also has a clearer idea of how they want vendors to build solutions with their H-series chips. 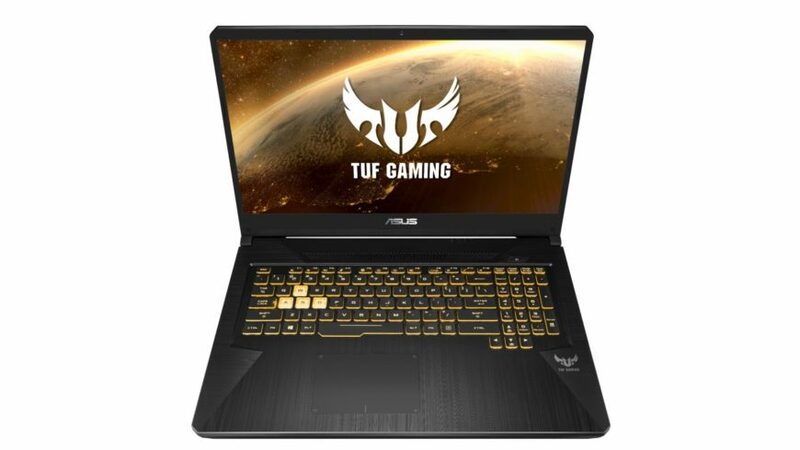 One example is this ASUS FX-series notebook from the new TUF range, which will ship with a Ryzen 5 3550H, discrete graphics in the form of the Radeon RX 560X with 4GB of GDDR5 memory, dual storage options, a 60Hz panel or a FreeSync panel, and a serviceable battery life because you’re not expected to be away from a wall socket for long anyway. What will make or break H-series adoption, though, is how closely AMD works with their partners to make these units good purchases. If they are too hands-off, it won’t improve. If not enough units get FreeSync support, consumers won’t be able to experience its benefits and look at buying a FreeSync monitor later on. And here’s the slide that shows why AMD needs to work more with vendors to make better notebooks. 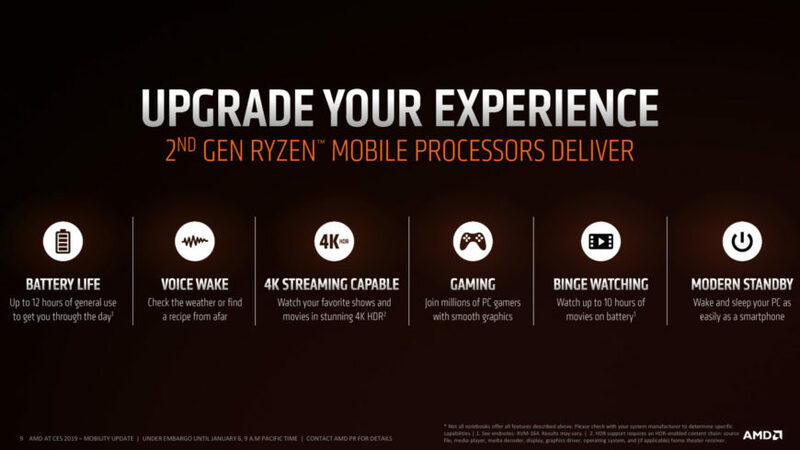 They are promising a raft of improvements to the Ryzen 3000 mobile series, including up to 12 hours of battery life in certain models, support for Modern Standby allowing your PC to enter a sleep state that still allows for downloading emails and working with voice commands, 4K streaming from content services like Netflix and Amazon, and gaming performance. These goals are within reach, but it requires AMD to put more work into their mobile ecosystem. Out of all these goals, Modern Standby is the most concerning. See, for the last six years Microsoft and Intel have worked together to implement Modern Standby in Windows 8 and Windows 10, and it’s never worked properly. Modern Standby was the cause of the widespread hotboxing issue that affected the Surface Pro and Surface Book families in 2015 and 2016, and Intel’s own attempts with other vendors to make it work have not been that successful. It’s either been held back by BIOS software, driver bugs, operating system incompatibility, or issues with Intel’s modem firmware. Modern Standby worked better on ARM devices than Intel’s processors. If AMD has truly cracked Modern Standby on Windows machines, they stand to pick up a lot of market share from people who want this kind of functionality built-in. It’s going to be tricky, and they’re going to need to market it heavily to give them an edge over Intel. 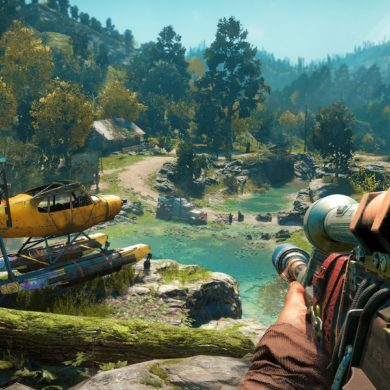 What might simplify the delivery of these promises is AMD’s renewed committment to their platform, particularly when it comes to software updates for Radeon Software. Currently AMD will seed their partners with updates for an upcoming release, and it’s up to the vendors to test the software with their machines and validate it. If everything works, they’ll ship the new drivers to customers and offer it on the driver support page for the notebook. If they don’t pass validation, they’ll stick to the last working drivers instead of the new ones. What consumers are left with are drivers that are six to eight months out of date compared to what AMD is actually giving the vendors to test with, and something the vendor has done causes problems with newer drivers. This, as you can imagine, has not gone down well with early adopters of Raven Ridge. Some of these problems range from games not running in full-screen, poor performance, clock speeds locking down to base clocks, displays blanking, BSODs, and FreeSync not working on the internal display or connected monitors. 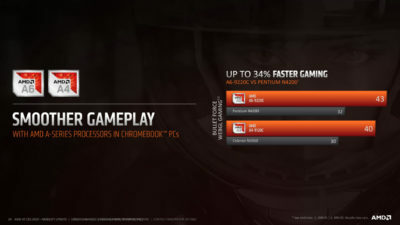 Not having regular updates meant that Raven Ridge notebook owners couldn’t benefit from optimisations for newer games and changes to battery life and display support. On the AMD subreddit, complaints have been piling up, pointing out that Intel and NVIDIA seem perfectly capable of shipping their own drivers for notebooks that work just fine, and that in the past AMD’s A-series APUs were on a much more frequent update schedule. Well, good news! 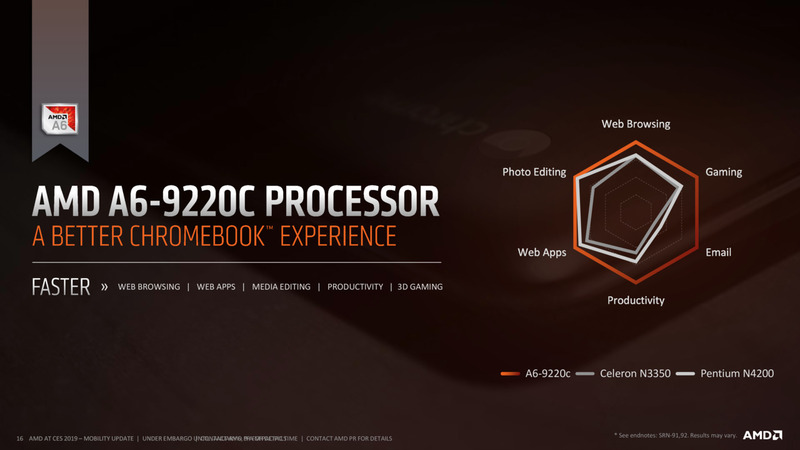 AMD has finally made the decision to merge the drivers for notebooks and their desktop graphics cards and put them on the same support cycle. Moving forward, ALL notebooks currently using an older driver version will be able to finally update on a regular basis without having to wait on the OEM vendor to hold up their end of the deal. There’s no plans to fix the power issues on several shipping notebooks by updating their BIOS defaults properly, but perhaps we’ll see a fix for this in software. This also means that for the first time we might get notebooks that work with AMD’s ReLive recording software, another heavily requested feature. 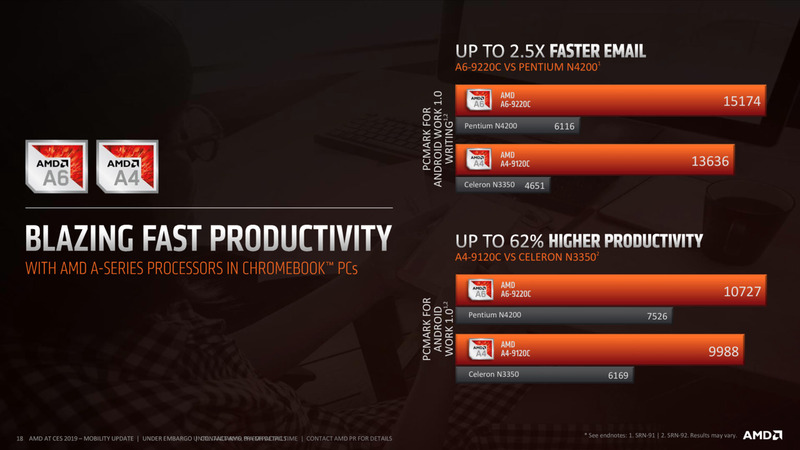 For the past year, there have been leaks from within Google’s ChromeOS and Fuchsia projects that suggested AMD would be supporting APUs that would be shipping in future products running ChromeOS. AMD sees Chromebooks as a growth opportunity among budget-conscious buyers looking for a cheap notebook that isn’t powered by an Intel or ARM processor.The market is still growing (although growth is predicted to slow in 2020), and the average selling price of Chromebooks has been steadily increasing. The margins on these devices are getting bigger, and they are good budget options for consumers. 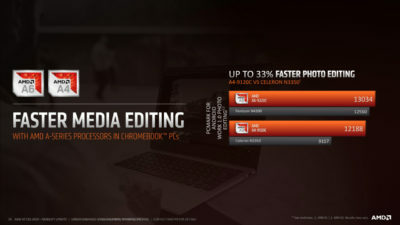 AMD has partnered up with HP and Acer to bring the first Chromebooks on AMD hardware to market. 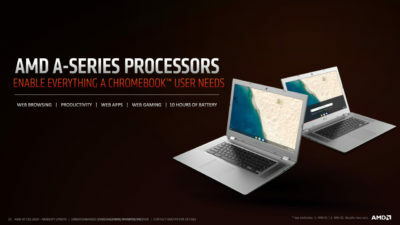 To service the market, AMD hauled out two Kabini APUs based on the older Jaguar architecture to service the Chromebook market. These processors are produced on an older 28nm process, have only two cores and 128 GCN shader cores for graphics. These aren’t just rebrands of the old chips, however, they’re actually new. 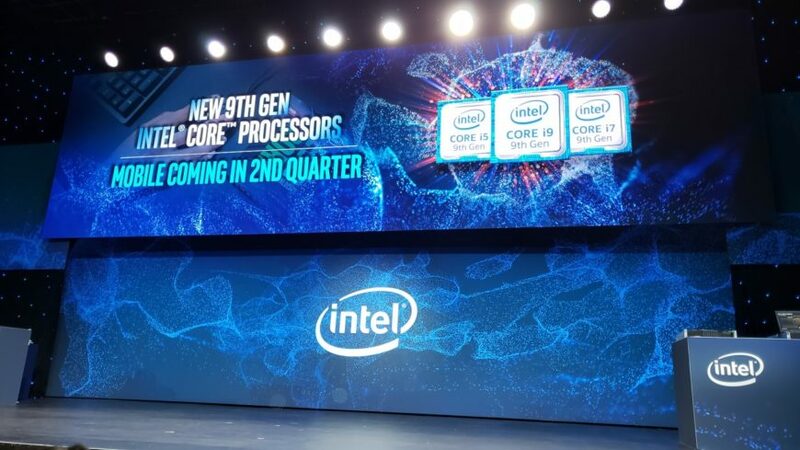 They ship with higher clockspeeds than the old Kabini Mobile processors on both the GPU and CPU, have a lower typical TDP limit compared to the older chips, and they now boast dedicated decoding units for VP9 and H.265 HEVC content. The 6W TDP will ensure that Chromebooks based on these units will have great battery life, and we can expect more than ten hours from Chromebooks with the A4-9120C and A6-9220C. I usually don’t point out details in footnotes because they’re not always that interesting, but this time there are some interesting details in AMD’s footnotes for this presentation. AMD’s slides include five pages of performance claims over competing hardware in the Intel Chromebook category. They claim wins across the board against the quad-core Pentium N4200 and the dual-core Celeron N3350. However, all these tests were done in a Windows environment, not ChromeOS. 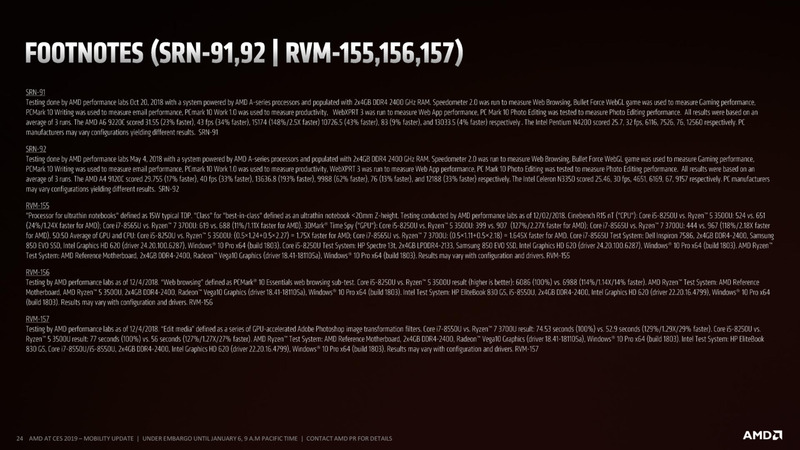 Slide 24 contains footnotes SRN-91 and SRN-92, and both detail benchmarks that were run on the competing systems. PCMark 10 isn’t available for ChromeOS. Windows is a much heavier environment than ChromeOS, so the performance differences shown here may not directly translate over on Google’s custom Gentoo Linux distribution. The other interesting detail on this slide is that all testing took place using Windows 10 1803, not 1809. 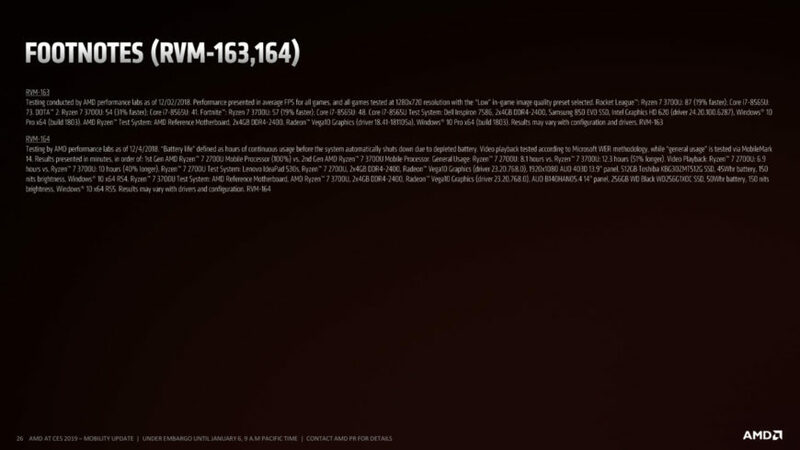 For the new A-series tests this was expected, because the 1809 update was not available in October 2018 to vendors and partners like AMD. However, it’s the RVM-155, 156, and 157 tests that are more interesting. Why test with 1803 when you’re running your benchmarks in early December 2018, when the update was generally available? 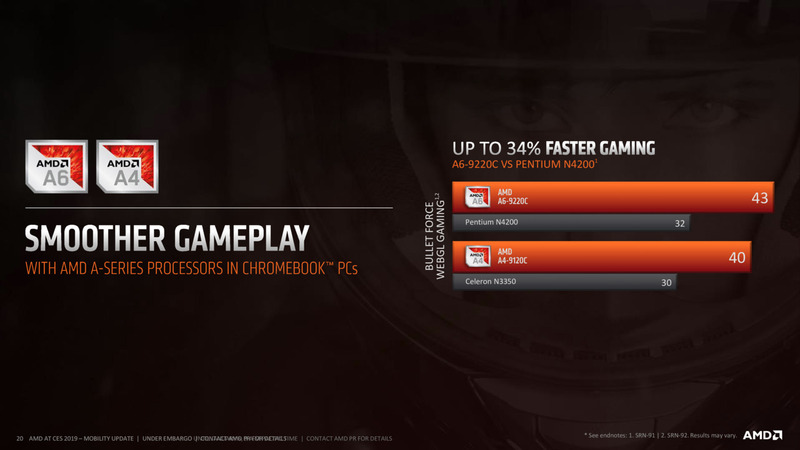 The answer may be that 1809 isn’t ready for prime time on AMD’s systems yet. I’ll have to ask why they chose this. We also just saw slide 9 promising 12 hours of battery life for Ryzen Mobile 3000 systems, but the footnotes paint a more detailed picture. The two test systems were a Lenovo Ideapad 530s with a Ryzen 7 2700U, a Toshiba 512GB NVMe drive, 8GB DDR4-2400 RAM in dual-channel, an AU Optronics 403D panel, and a 45Wh battery. The Ryzen 7 3700U test system has the same amount of RAM, a WD Black 512GB NVMe drive, an AUO B140HAN05.4 panel (which doesn’t officially exist yet), and a 50Wh battery. The battery is 11% larger, but that doesn’t account for the other increases in battery life in the test. The panel differences may also play into it. Manufacturers like AU Optronics are expected to release super-efficient panels capable of 1W loads, so halving the display’s power draw and using a more efficient SSD may have contributed. 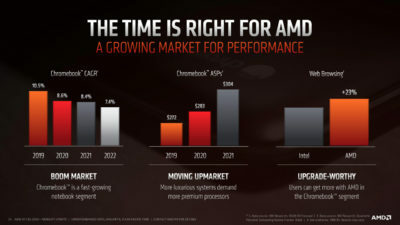 AMD could have pulled a rabbit out of its hat with the Ryzen 3000 Mobile series, but it’s more likely that advancements in the system as a whole contributed to the improved battery life. AMD is at CES 2019 this year and will be the opening keynote for the conference for the first time in the company’s history. Stay tuned for more!